All the clichés come to mind when standing on the edge of the crater on top of the Erta Ale volcano: being on top of the world, taking the trip of a lifetime, seeing the inside of the Earth, etc… the emotion is so strong in that privileged moment that we remain speechless. Already, the walk up to the crater in the dark makes an impression. Using a torch light, we were guided by a local Afar guide who showed us the way up to the volcano in the feeble moonlight. The path was sinuous and rocky in some parts because we were actually walking on old hardened lava but couldn’t see it at the time. A camel was following us to carry all the belongings we would need for the night there on top, as well food and water. Along the way, we came across a couple of camels following another group also climbing up for the night. After walking for about three hours, as we reached the peak, we had an emotional moment when we suddenly saw a red light glowing through a cloud of smoke, it was the Erta Ale volcano in the distance. Another strong impression. We took another turn and the light disappeared, but a few minutes later, we recognised the camp with its circular roof-less stone shelters and the group of armed soldiers there to guard against likely terrorist attacks (a serious one in which five tourists were killed, occured a year before in January 2012). We were going to continue on the track, past the camp, when instead, our guide took us down a steep and rocky path which completely confused me. 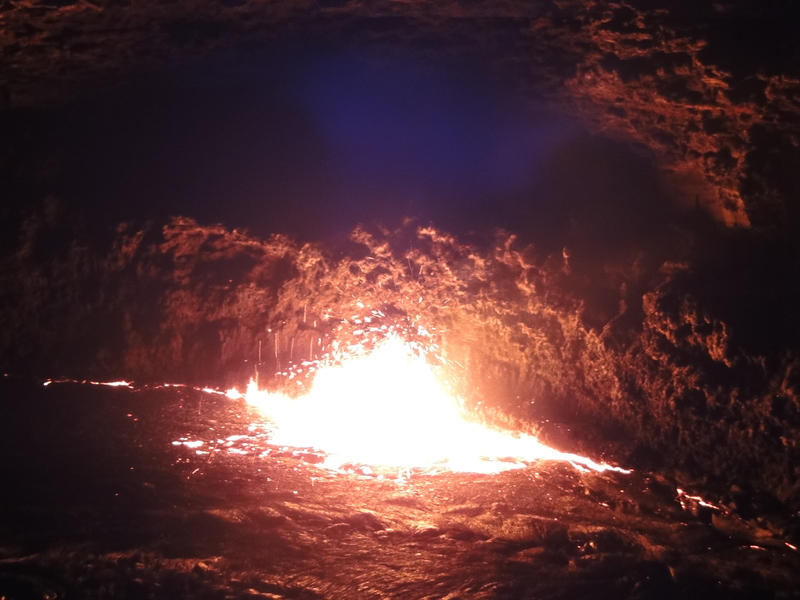 I realised looking all around with my torch, that we had gone inside an old crater which we had to cross to reach the live volcano. 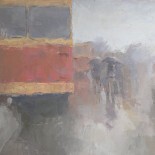 The experience was surreal, I had lost any sense of bearings and felt I was living a scene out of a book. 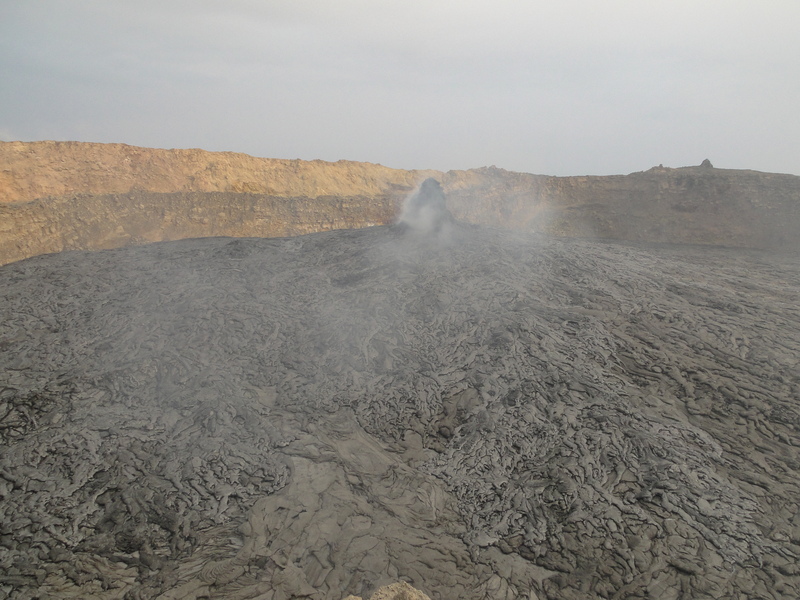 A few minutes later, we were on the edge of the live crater, the highlight of any trip to the Danakil. Like the many people who made the trip before, I couldn’t believe I was so close to a live volcano! 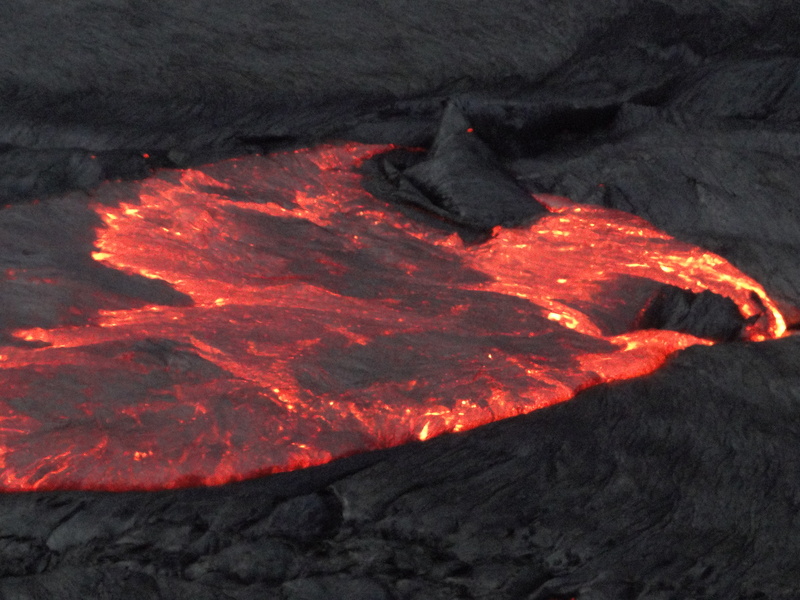 The lava was in continuous movement like a thick boiling soup and would suddenly crack into a fire line or unexpectedly erupt into a firework that would last for a few minutes. In front of such an amazing sight, many pictures come to mind. The picture of hell as imagined by ancient writers and storytellers with the mouth of the volcano swallowing anyone venturing too close, or maybe a witch’s caldron into which victims would disappear forever unnoticed. We were so fascinated that we sat there for hours watching it. However strange it was next a volcano, we only left when we started to feel too cold to stay put. The wind was so piercing and freezing that we decided to go back to the camp to get more clothes. However to our biggest surprise, the camel hadn’t made to the top but stubbornly stopped half way up, refusing to move an inch further. So we were left to shiver for at least another hour, while we sent another camel down to collect our bags. Between all the shelters, we chose an open air one away from the rest of the camp and fell asleep watching the stars again, finally tucked warmly into our sleeping bags. At dawn the next morning as we woke up, I realised how close we were to the edge of the old crater; a false move walking blindly during the night could have been fatal. We quickly gathered our stuff and loaded our camel before going back to the live crater to see it during daylight. It was a different sight: after the spectacular fireworks of the previous evening, we could now see the lava at work and observe the volcano. It was just as fascinating, even more so as we could better see the crater rim and surrounding landscape. Erta Ale has a number of craters but only one is currently active. As we walked back, we came across another impressive site: one of the dormant craters. In the middle of it, a tall lava chimney had formed from which smokey gases were still emanating. Another eery and surreal site. Unfortunately, as we got back to the sleeping camp in full daylight, another less pleasant site became too apparent: all the plastic bottles and rubbish left on the ground by previous visitors. A disgrace! I am always shocked to see that people dispose of waste as if nature was an unlimited dumping ground. 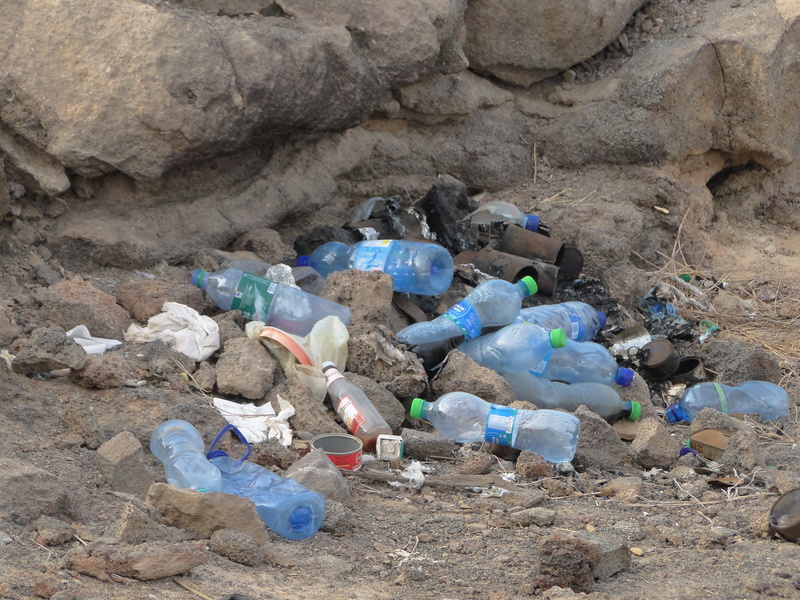 In Addis, plastic bottles have a sale value (a couple of birr each), so people recycle them, but in Afar, it doesn’t seem to be the case and plastic bottles are forever polluting the edge of the volcano. With this unfortunate sight in mind, we took our walk back down to the rocky and sandy plain at the base of Erta ale. Our last stop on our trip was the Afdera salt lake, about three hours south of Erta Ale. After days of sand and dust, I was looking forward to a nice swim in the lake, which I was told was like the Dead Sea, so salty that we would float. The programme was enticing: a swim in the lake or nearby hotspring and dinner al fresco. 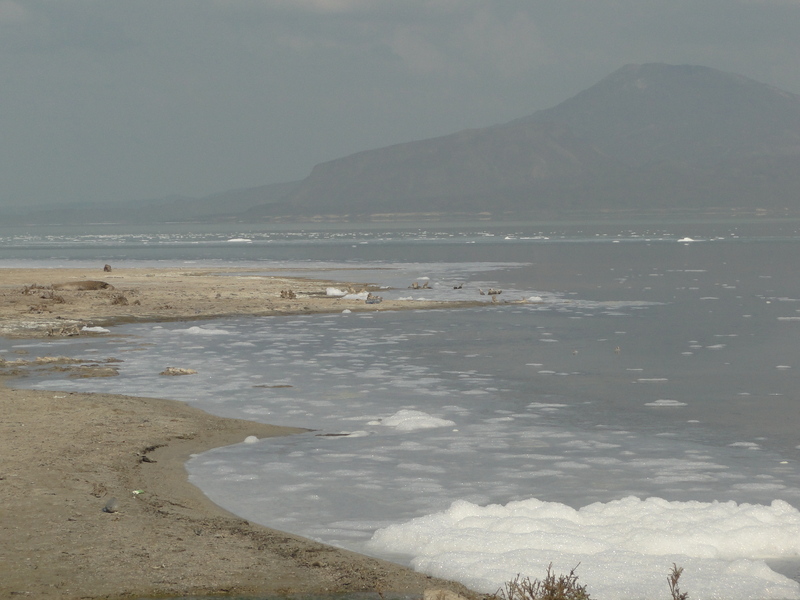 The reality was otherwise: Lake Afdera was covered by so much foam that I didn’t dare to swim. The hot spring was a tiny pond feeding into the lake, but so close to the road that it wasn’t a relaxing place to bathe (in fact the water was far too hot considering the outside temperature of about 35°). As a matter of fact, the area around Lake Afdera is developing quickly due to the industrial salt production and manmade salt plains, so fast that the urban infrastructure cannot follow and the local town, which is a temporary home for the salt workers, comes across as a huge dump with piles of rubbish lining up into the main street. Not a nice place to spend the last night of our amazing trip, which is a shame as it had the right potential! We ended up staying by the lakeside, trying to have dinner while getting rid of the many flies annoying us, and sleeping early to be able to leave the place as quickly as possible to take the long drive back to Mekele (in the rain surprisingly!). The plan was successful as we got to Mekele in the early afternoon and had enough time to take a walk around this pleasant Tigrean capital before flying back to Addis the next morning. Sounds really like a great trip! 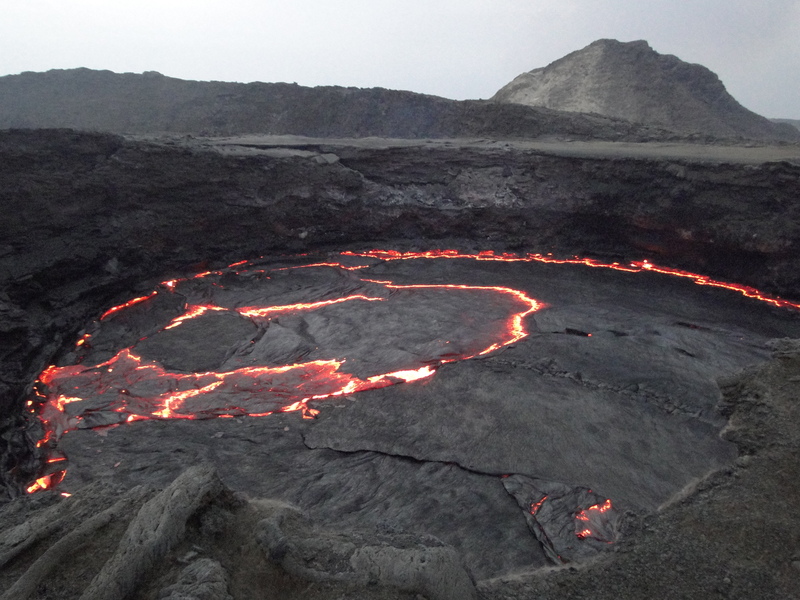 This entry was posted on February 4, 2013 by Salambo in Danakil, Travelling outside Addis and tagged active volcano, Addis Ababa, afar region, afar triangle, crater, crater rim, danakil depression, Erta Ale crater, Erta Ale volcano, Ethiopia, gases, lake Afdera, lava, Mekele, salt plains.